OLYMPIC GLORY (IRE) (Bay 2010-Stud France 2015, Aust. 2015). 8 wins-4 at 2-from 6f to 1m, £846,073, €694,295, Ascot Queen Elizabeth II S., Gr.1, Newbury Lockinge S., Gr.1, Longchamp Prix de la Foret, Gr.1. Related to SW Wootton Rivers, etc. Sire of SP Mintd and of Athmad, Blury, Inde, Motashakel, Pythion, Australien, Fantastic Glory, Glorious Spirit, Astronaut, Dream of Glory, Duchess of Glory, Got Wind, Nouvelle Voie and of the placegetters Blissful Beauty, Coastguard Watch, etc. His oldest Aust.-bred progeny are 2YOs. REMERGED, by Sebring. Winner at 1300m, 2d MRC The Cove Hotel H. Half-sister to Admiral Jello. Dam of one named foal. Admiral Jello (Fastnet Rock). 4 wins from 1300m to 2400m, A$295,075, to 2016-17, ATC TAB H., TAB Rewards H., 2d ATC Colin Stephen H., Gr.3, Canberra Cup, L, ATC Theraces H., Jockey Celebration Day H., 3d Newcastle Gold Cup, Gr.3, ATC City Tattersalls Club Cup, L, Theraces H., NSW Tatt's RC National Jockeys Trust H., Taree Cup. So You Merge. 3 wins from 1500m to 1700m in 2017-18 in Aust. Lucky Deja Vu. 2 wins at 1200m, 1300m in Aust. Adamina (Snitzel). Winner at 1100m in 2018-19, 2d ATC Widden S., Gr.3. Misty Lad. 2 wins at 1400m, 1600m in 2017-18, 3d WATC Amelia Park H.
Lieutenant Dan. 2 wins at 1000m, 1200m to 2017-18 in Aust. DEMERGER (Saithor). 8 wins. See above. Trader (Dehere). 3 wins to 1500m, A$181,725, STC Theslipper.com.au H., Top Cut Steaks H., 2d MVRC Crystal Mile H., Gr.2, STC Premiere S., Gr.2. IMPETUOUS (Fastnet Rock). 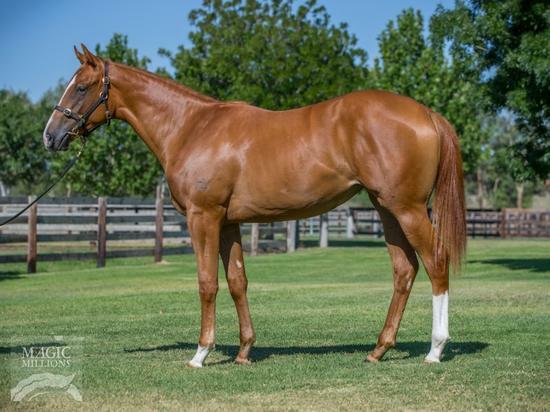 3 wins at 1350m, A$124,950, Wyong RC Mona Lisa S., L, 4th Scone RC Inglis Guineas, RL. Tribunal - Happy Boy (H.K.) (Encosta de Lago). 3 wins from 1400m to 1700m, A$117,888, HK$747,500, MRC New Litho H., Always There H., 2d HKJC Silver Lining Cup H., Fan Lau H., 3d VRC Super Impose S., L, HKJC Billion Win H.
Triangular. 2 wins at 1600m, 1700m, MVRC 3YO Fillies Super VOBIS H., 2d VRC Hay Group H., 3d VRC Ansis Dizgalvis H. Producer. ROYAL RADA (Haradasun). 10 wins-1 at 2-to 1400m, A$250,015, Kalgoorlie Boulder RC Hannan's H., L.
MAJESTICALLY (Maroof). 10 wins-2 at 2-from 1100m to 2400m, A$677,593, AJC Summer Cup, Gr.3, STC Frank Underwood Cup, L, Lord Mayor's Cup, L, Stayers' Cup, L, 2d STC Todman Slipper Trial S., Gr.2, NE Manion Cup, Gr.3, Clarence River JC Grafton Cup, Gr.3, AJC Australia Day Cup, L.
Rose Beat (Rhythm). 3 wins to 1400m, A$80,490, VATC Allan Wicks H., SAJC Jayco Caravans H., Christmas Twilight H., 2d VATC Chisholm P., 3d VATC Lord S., L. Producer. Darmala (Danehill). 2 wins at 1200m, STC Lone Star H., BTC Members' H., 2d QTC Sir Douglas Wadley H., L, 4th AJC James HB Carr S., L, Geelong RC Oaks Trial S., L. Producer.